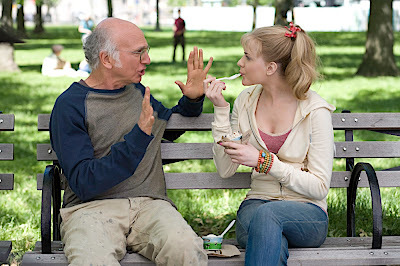 And fittingly for a film that celebrates the randomness that guides our life to cherish "whatever works" with whomever we happen to encounter through chance, the fortune cookie cliché that the third time's a charm also proved true for Larry David’s collaboration with Woody Allen. 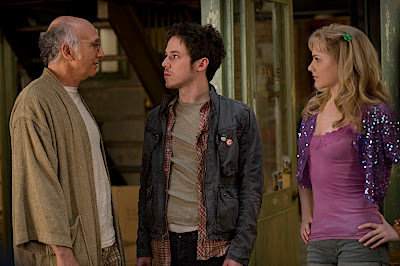 Despite trying to talk Allen out of giving him the role that had originally been crafted for Zero Mostel, Larry David rebounded from the debut of his "bald head," in Radio Days and another "tiny part" in Allen's segment of the Scorsese and Coppola compilation film New York Stories into portraying the monologue spouting misanthropic string theorist Boris Yellnikoff in Whatever Works. We open on David's grumpy older man to discover that a failed suicide attempt has left Boris minus a wife and plus a limp before confessing that not only is he "not a likable guy" but that we've also begun watching what is "not the feel good movie of the year." Yet as theorists would no doubt have calculated during the opening credits, the combination of Allen and David is mathematically sound in the humor department. 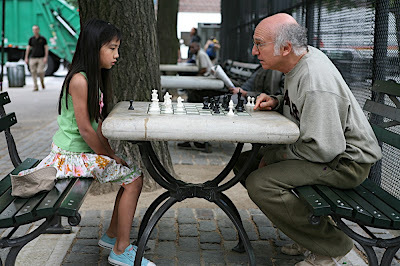 Soon we learn that the former contender for the Nobel Prize in Quantum Mechanics now divides his time bullying children unlucky enough to have been placed under the former Columbia professor's tutelage as a chess professor in the park and discussing the meaninglessness of life with his best friends. However, since even his friends find Boris far too much to bear from time to time, it's the great gift of chance when Evan Rachel Wood's beautiful but dim-witted escapee from the southern beauty pageant circuit winds up a cold, huddled mass outside his New York door. A runaway from the religious right just barely out of her teens, Wood's Melody St. Ann Celestine is the opposite of the uptight Boris in every single way. But Melody's guileless demeanor and unwillingness to judge Boris' obsessive compulsive need to sing "Happy Birthday to You" twice while washing his hands slowly charms and disarms him. While it starts out slowly, soon the irrational relationship of the two from strangers to platonic roommates evolves when her admission she's developed a crush on him prompts him to encourage her to date others. Of course, once she does date a man other than Boris, Boris realizes how much he's grown accustomed to the sunny, supportive, and eager to please Melody who's taken to spouting his misanthropic monologues of molecular mayhem back at him. A beautiful girl who gazes in wonderment at an IQ is clearly a seductive thing to a loner like Boris so visibly baffled by the scientific improbability of it, he decides that the random chaos that led them to the same apartment may as well transfer to marriage, despite the fact that he has more interest in companionship than anything remotely carnal. However, regardless of the fact that attraction is impossible to define and a person's physical appearance can increase or decrease as we uncover more about their personality, Allen wisely adheres to the old-fashioned feel of the film knowing full well that the potential of the "ick" factor of such a May/December coupling could derail the movie for certain factions of the audience. To this end, he leaves everything behind closed doors in a film that is tonally the opposite of the sexually charged Vicky Cristina Barcelona and by his own admission, Allen creates a "much more sentimental picture than the story would have you think." 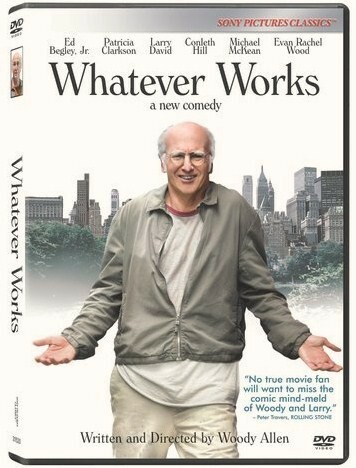 On the surface, of course, it's easy for viewers to mistake the far more depressive curmudgeon portrayed by Larry David for a sort of distant cousin to the fictitious version of Larry David the comedian portrays on his fully improvised HBO series, Curb Your Enthusiasm. 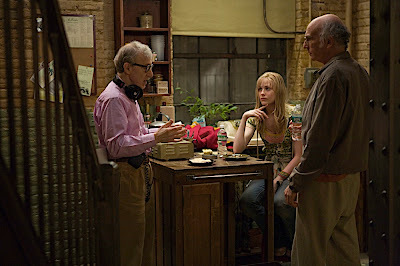 Likewise, in the same token, enthusiasts of the filmmaker's work will certainly acknowledge that Allen's humanistic obsessions, character devices, plot-lines and situations echo earlier films ranging from Annie Hall to Crimes and Misdemeanors and others since Allen's oeuvre has spanned over forty years. However, in my mind Whatever Works has much more in common with Vicky Cristina Barcelona than one would immediately think. For unlike characters who broke apart even though they needed the eggs of relationships in Annie Hall or were separated by a continent in Manhattan, even when Melody's relatives (Patricia Clarkson and Ed Begley Jr.) show up out of the woodwork to discover their true selves in New York City and their arrival tests Melody and Boris' marriage, we're provided with an extremely different result by the time the film ends. Perhaps it's due to age or perhaps it's because he finally gave up psychoanalysis or theorized that just because everything is fleeting it doesn't necessarily have to coincide with doom but whatever the case may be and--regardless of the quality of the films themselves-- Allen's post '80s comedies are becoming lighter and more life-affirming with each passing year. Additionally, although it was written in the past, Whatever Works may as well echo Woody Allen's own statement of "the heart wants what it wants," regarding his relationship with Soon-Yi Previn or the idea that knowing yourself fully before you can successfully be with someone else is key. So along with Melody we find that by looking past the insults and defense mechanisms to see the real person or just giving into luck, happy accidents, or whatever makes sense for us that doesn't harm another individual is the answer in this life. Thus we realize that the misanthrope was a romantic softie all along and despite some of the familiarity of Whatever Works, it nonetheless provides comfort, solace and joyous cinematic escape from mindless summer movies, economic hardship, and increasingly bleak newscasts. In one of the simplest yet most beautiful scenes, Melody opens Boris' eyes to the medicinal pleasure of classic Fred Astaire movies to ease his panic attacks, thereby affecting the way that the two relate to one another via cinema. 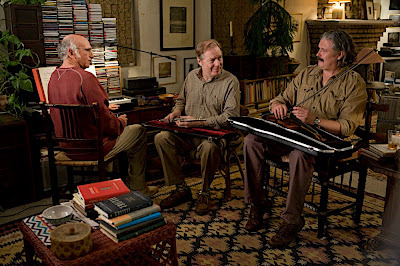 And although on a purely film buff level, the entire time I felt that it was simply a more romantic version of the way a Marx Brothers movie literally saved Allen's life in Hannah in Her Sisters, upon my second viewing I realized that there's another layer to it as well. 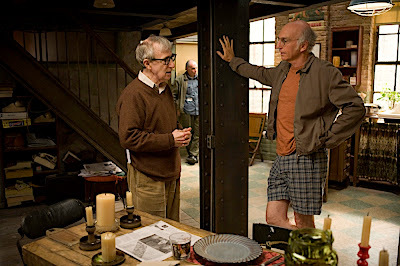 Essentially and for several decades, Woody Allen's films have served and will continue to serve that very purpose for generations of viewers in reminding us of the impact that his unique brand of cinema has had on our lives. And as such, Whatever Works works marvelously for me as that rare movie that makes you want to reach out to strangers, call an old friend and overall, give yourself a break when you realize that all planning aside, be as good as you can be but enjoy yourself because it's all luck and lucky am I to have found Woody Allen's movies.